Cottage Succession Planning-It is important for you, as cottage owners, if your considering passing the property on to your children to begin exploring the options available. This is something you need to do especially if you want to leave the property trouble free for the next generations to enjoy. Not planning for this may result in your families selling just to pay the taxes. The best advice I received for cottage succession was from Douglas D. Buchmayer, partner in Gowlings Law Firm. Please say you found him on Peter's Cottage Site! Read his article on cottage succession! Thanks DOUG! The most important financial issue is the resulting capital gains tax. For your spouse to have ownership upon death it must it be jointly owned as Tenants-in-Common with right of survivorship. If it not held as above the will takes over and the property could be deemed to have been disposed of at fair market value. Taxes will be have to be paid. Simply willing the property to your children will result in the capital gains taxes liability. Consider a life insurance policy sufficient to cover the taxes at death. Don't want to pay, have your kids share the cost of the insurance premiums, ensure it is sufficient to cover the liability. Transfer the property to your spouse. Talk to your lawyer! Gift the Property - now in this case the cottage is deemed to have been disposed of at fair market value. You will now have Capital gains taxes applicable and payable. If the cottage is in your Will. It is considered to have been disposed of upon death. The property can be transferred between spouses without tax, with right of survivorship. The Capital Gains tax would be only be payable upon the death of the second spouse. Consider which is more valuable your house or your cottage. 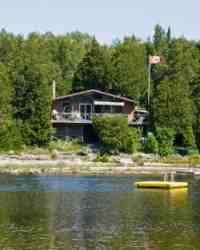 If your waterfront getaway has a huge gain payable claim it as your principle residence. Be careful though now your home is subject to capital gains. Get expert advice. A more sophisticated strategy, transfer title to a Not-For-Profit family organization. Will result in capital gains now but greatly benefits future generations. This requires specialized advice. Establish a trust. No capital gains at first but upon your death and every 21 years after they have to be paid. There are a variety of strategies to reduce the capital gains tax liability in your cottage succession strategy. You need to discuss the situation with professionals and your family. Move forward with the best strategy for your family and circumstances.